One of my favorite side projects is laser cutting. Whether I’m laser cutting a custom notebook cover, posters, earrings or special cards—I love the process. Laser cutting allows me to play with different mediums (so far, wood is my favorite), and get away from my desk. My goal is to continue iterating and then bringing a few lines of crafted items to market. 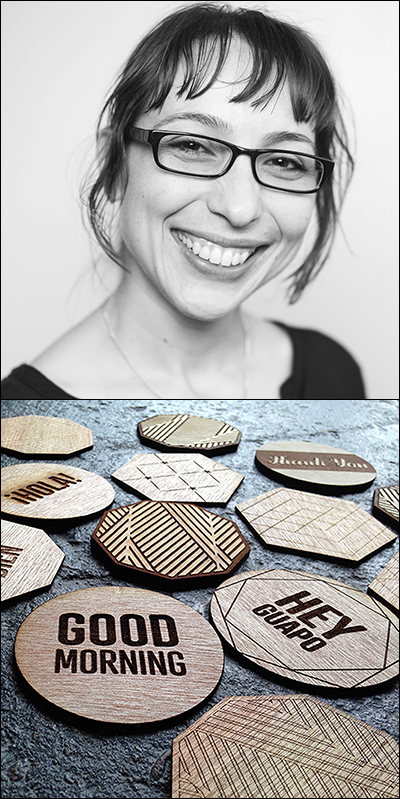 I’ve previously sold some of my laser-cut coasters and earrings at a holiday market in Houston, and intend to do more of that in the future. A few other side projects, or perhaps, explorations that I’ll be focused on this year (in addition to laser cutting) is practicing calligraphy, getting back into sewing, diving into Processing, and hopefully learning and getting an intro to woodcarving. My weekday office hours are dedicated to the work that I’m doing as a contract graphic designer for a couple of firms. I’ll either use time after work, or most often, on a weekend, to engage side projects. I manage my time by keeping track of all project deadlines on Google Calendar, and working on personal projects around my client-work projects. I’ve also used Trello in the past to keep a running tab of projects that I’m personally focused on, but these days, it’s a combination of Google Docs and stacks of notebooks that contain my ideas/projects/brainstorms. I’m interested in a variety of fields and mediums for continuous learning and growth. Having side projects enable experimentation, the ability to fail (often), and to recharge by playing and exploring something very different. I find it exciting to delve into new things. I don’t like being locked into one title and/or field, nor do I like only sitting in front of my desk and computer. I like to get out and work with my hands, do something new and see where it takes me. Sometimes, a side project will spark an idea that can cross into my client work for a project. Most of all, I can just explore. Images courtesy of Erma Tijerina. Portrait by Trish Badger Photography.